I am so fortunate that I get to do what I love and make what I think is beautiful and other people can appreciate it as well. I am very sure to include gratitude as a part of my every day. When I am not in the glass studio you can find me and my family outside. We are so lucky to live in gorgeous Colorado where the weather lends itself to outdoor activities often. I like to take my children out and rediscover the magic of the world around us and the gift of just "being". I have been looking for plastic alternatives to almost everything in the house. It didn't occur to me that I could replace plastic straws with glass ones! When Melissa from Moxie Glass contacted me I was so excited! •Too cute to pass up! The critters are just too cute! There are so many options available. If you can dream it, they can do it! There are geckos, turtles, dragonflies, panda bears, ladybugs, frogs, flowers, cats, mice, fish, bumblebees, dolphins and even an octopus!! I found that these did not fit our Copco BPA free tumblers. So, I have been using them without a lid. I highly recommend getting one of the ReUsable Tumblers Moxie Glass sells (for $11) to put your straw in. Then you can take it anywhere and show it off. If you already have a cup you can get an 8mm straw that is sure to fit! The only downfall is that these are not the best option for young kids. Try stainless steel for them! What do I ♥ about them? I think the best part about these is that they are handmade and non-toxic. Even the packaging they use is free of plastic! Of course, I love love love the cute critters (something you can't have with stainless steel). There are so many great designs to choose from you will definitely want more than one. Moxie Glass offers $5 flat rate shipping too! I love how easy it is to clean these. Just a little hot water will get even some of the stickiest messes out. 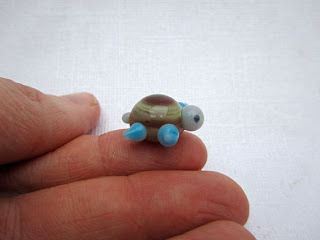 Check out Melissa's Etsy shop Many Mini's. She makes the most amazing things with blown glass. 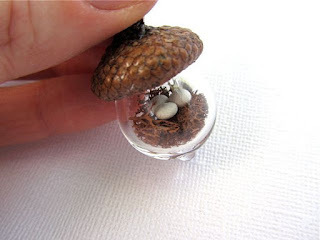 You will find everything from terrarium necklaces to glass pens! You can wear a live plant around your neck! How cool is that? She even makes critters without the straw! Here are a couple of my favorite items. 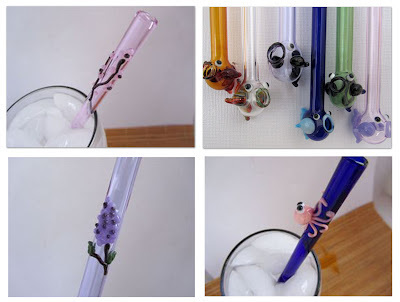 Get your own handmade glass straws from the Moxie Glass Company. You can choose from all sorts of shapes and sizes. They range from $2.50-$10 with $5 flat rate shipping! Come back July 4-13 for the Made In The USA Giveaway Hop for a chance to win your own assortment of straws from Moxie Glass Company! The giveaway will be open to the US & CAN. Just look for this button on my sidebar!